Paris Saint-Germain suffered their first Ligue 1 defeat of the season on Sunday night, losing 2-1 to an emphatic Olympique Lyonnais side. While Angel Di Maria bagged an early goal for the visitors in the seventh minute, subsequent strikes from Moussa Dembele and Nabil Fekir at either sides of half-time completed the home team’s sensational comeback. 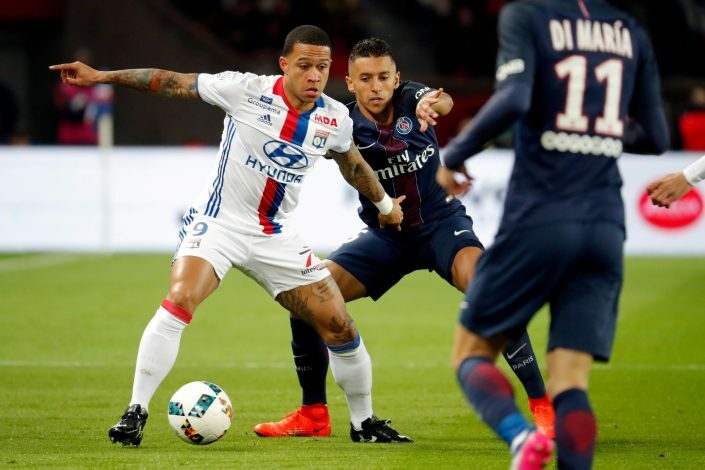 Memphis Depay produced a sublime display against the capital club, terrorizing veteran full-back Dani Alves on the left wing throughout the encounter. In fact, the Dutchman’s performance was so good, that several fans of his former club Manchester United now want him to return to the Theatre of Dreams. The 24-year-old recently opened up about his future, expressing interest in securing a move to some of Europe’s biggest clubs, whilst naming the likes of Real Madrid, Barcelona, Chelsea, Manchester City, Paris Saint-Germain, and Bayern Munich as potential destinations. Much to everyone’s surprise, however, Memphis completely omitted Manchester United, who have lately been the best team in the Premier League under new boss Ole Gunnar Solskjaer. The Old Trafford outfit does possess a buy-back clause in Depay’s current contract with Lyon, which would significantly aid them in re-signing the player if need be. And with Solskjaer himself present at the Groupama Stadium on Sunday to scout PSG, United’s upcoming Champions League opponents, Depay might just have made a mark on the Norwegian with the shift he put in against the reigning French champions.